Put simply, the drama tells a story of two adults who experience what we call the ‘midlife crisis’ before they set out to find new meaning in their lives. I feel that it has flown under the radars of many due to the abundance of new kdramas and lack of coverage on the blogosphere in general, but I think more people should be watching this! It is a remake of the Japanese drama with the same title; I did not watch the original but I am liking the Korean version as it is. The story moves along steadily, and I really enjoy the subdued performances from the veterans at the helm. I have watched Ji Jin-hee since his early days as an actor and am very happy that I will be watching his latest drama in entirety since that has not been the case for a few years now. Still, I fangirl over him whenever I get the chance 😛 He stars as Ko Sang-sik, a section chief for the government who had a painful past of losing his wife. 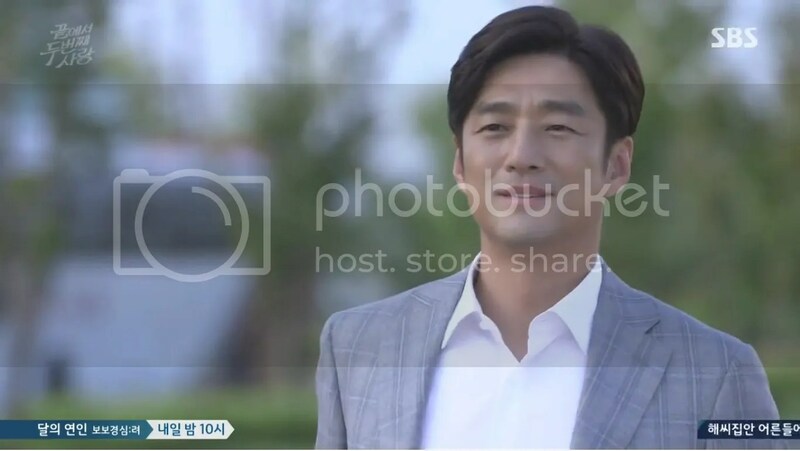 Then he meets Kang Min-joo played by Kim Hee-ae, who is a drama producer at a broadcasting station and the drama shows the development in their relationship as well as growth as individuals. Our past experiences do, to a certain extent shape the person we become; or rather they will impact the way which we do things and make decisions. Sang-sik and Min-joo are polar opposites: he lives his life peacefully to keep his family and career together while she’s an independent superwoman with lots of sass in her that is evident in both her work and daily life. After losing his wife, Sang-sik treats his family and career with even more responsibility and treads carefully because he does not want to lose his loved ones anymore. Following her fiancé’s passing due to an incident, Min-joo on the other hand toughens up and develops a very strong front making her own decisions and leading an independent life. Although they are very different in terms of character, they both have this undeniable chemistry and I feel sparks during their interactions. At any stage of growing up, I am sure everything we have experienced before would have had some impact on us in some way or another. There are many things in Second to Last Love which I find worth pondering over, because the drama is really all about life. Some of the questions asked are food for thought and we typically do not think about them. For instance Sang-sik might have a successful career that earns him income and a happy family but is that all there is to life? As for Min-joo, her producer job is also on track, she is able to support herself and leads an independent life but is she truly happy? That is where the midlife crisis kicks in – both of them begin to wonder what they have been working hard all their lives for. As more doubts appear in their minds, they become conflicted inside. Young people can relate to this as well: it’s a slightly different kind of uncertainty but essentially the same since we also do not know what the future holds for us. And at a certain age, the adults continue asking themselves the same question because who would know what is in store for them beyond the present? Upon reaching their 30s and 40s, Sang-sik and Min-joo have lived their lives in a certain way for over a decade or so. Thus there is tendency of resignation to “fate”, meaning “this will be how I am going to live the rest of my life” without much thought of making any change. 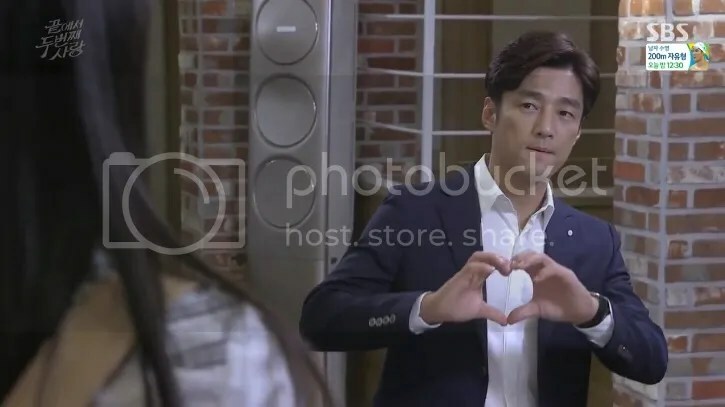 For example in Sang-sik’s case where he almost completely cuts out the idea of falling in love again and gives up new possibilities when Min-joo tries to take the first step forward. This brings me to the story of the turtle, which the pub owner in Sang-sik’s neighborhood tells him about. (Thanks to writer-nim!) He likens the middle-aged adults to a turtle with dismembered limbs because they are too busy living their lives caring for their families and working so hard they forget about themselves. And the only way is to break open the “armour” (turtle shell) before getting trapped inside. Learning is a lifelong process. Even as we grow older, there are lots of things to discover about life and the world. Sang-sik is still learning how to be a good boss, father, sibling, neighbor and friend – with the various roles he has to take up, he has his difficulties and the part that stuck with me the most was when he reconciled with his teenage daughter Ye-ji after an argument. I teared up at that particular scene; it was a memorable one. Min-joo is also learning how to stay relevant at her workplace, as well as what makes or breaks a relationship. I like many of the lines in the drama but there’s one I want to write about. This statement rings so true. Babies and toddlers cry out loud when they’re in pain but once we become adults, we cannot just cry out like that and at the same time it is no longer easy to find a way to express our hurt or any emotions for that matter. Furthermore Min-joo is alone so she’s learnt to bottle up her feelings inside, but how long can someone last like that? We all have moments of weakness, and that’s why people break down. Some of the subplots revolving the others around Sang-sik and Min-joo are also interesting. They also reflect other problems in life. For instance, we have Sang-sik’s sister and her husband; the married couple also have their own issues, not just those who are single! Ye-ji also had her share of relationship matters even as a teenager, which in a way reflects those faced by the adults. Sang-sik’s youngest sister, Mi-rae (Kim Seul-gi) also faced obstacles with regards to her dreams of becoming a writer. Everyone in Sang-sik’s family is so bonded – it’s heartwarming to watch them stay together. As much as Sang-sik is always concerned about their well-being, I can see that they also love and care for him very much. That includes Jun-woo (Kwak Si-yang) as well. The whole family atmosphere makes me feel so warm and fuzzy inside. I also want to give a shoutout to Sang-sik’s team members at work. As his subordinates, they share very good camaraderie and we can see them united as one while organising and carrying out the various work projects for the tourism board. On that note, the shooting locations for the drama are really pretty – I like that they were made relevant to both Sang-sik’s and Min-joo’s jobs. I watch a lot of dramas because I have a blog in Argentina in Spanish. And this was me in the inkwell. The writer is the same of Emergency Couple and also a very good drama couples, divorce or deep in their approach. Early episodes were not very attractive to me. But I see if I get a time and look. Hello~ I see! Yes STLL is by the same writer from Emergency Couple – indeed. I do like the way she explores the problems faced by different couples 🙂 Hmm for me I found the early episodes pretty funny, and the leads have good chemistry. Sometimes it’s the kind of mood we have for certain dramas – do try it again, you might think differently a second time. Thank you for reading! Thank goodness there is someone who is recognising the gem in this show. Yes, the show has fallen under the radar simply because it is so silent on blog sphere. Yet I find this show and it’s storyline far more solid and superior than what is currently aired. I guess it caters to different segments of audiences. And this particular segment doesn’t take it to blog sphere as much as the younger audiences.